Happy New Year! Past and future architecture. And isn’t that what makes cities great? 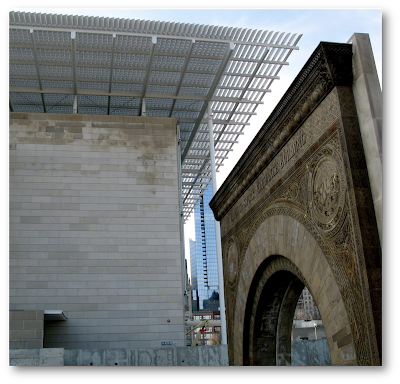 What I’m looking forward to in 2009: The grand opening of Renzo Piano Building Workshop’s Modern Wing at the Art Institute of Chicago. Above, on the left – Piano’s Modern Wing due to open May 16, 2009. Yes, that is Frank Gehry’s Pritzker Bandshell and trellis you see above. Neatly engineered, this bridge shoots across the many lanes of Monroe street. Of course the bridge will be modernist white when finished. And doesn’t the city look great, in this winter photo taken yesterday? That gleam, rising on the left, is the still-rising Trump Hotel and Tower. You do see it even from afar. I’ll have more on Renzo Piano in Chicago soon. Including views inside the galleries. Happy New Year! Here’s to a fine ’09 – together. 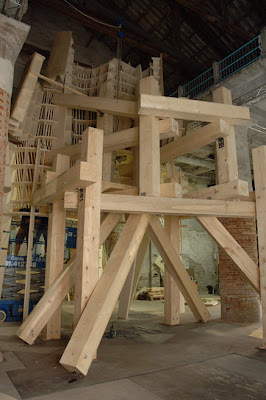 Frank Gehry’s installation at the current Venice Biennale. But nothing about its wonderful name. He calls it Ungapatchket. the open trellis he designed to go in front of his bandshell in Millennium Park in Chicago, and I asked him what Chicagoans will do when it rains, because unlike in L.A. it rains often and a lot in Chicago, Gehry told me, “They didn’t want to spend the money for a retractable cover, so, you’ll throw a schmata over it!” Yiddish for rag. An adjective based on a past participle, of the verb ‘onpatshken’, to sully. The stem of the verb is Slavic, and the prefix is Germanic, cognate with German an-. The differences in spelling reflect both the various ways of spelling Yiddish words with Roman letters, as well as differences in dialect — ‘un’ is southern, and ‘on’ is northern. According to the YIVO system used by scholars to write Yiddish words with Roman letters, the word is spelled ‘ongepatshket.’ but other spellings can be fine. As a side note, the same Slavic root gives rise to another less common Yinglish word, ‘potchkey,’ meaning to fiddle around. Maybe that’ll be the next piece by Gehry. Potchkey. 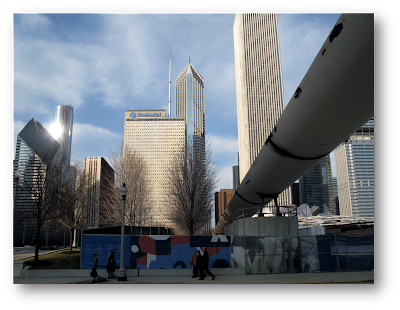 You are currently browsing the archives for the Pritzker bandshell category.